At the Society of Actuaries's recent conference on Equity-Based Insurance Guarantees, one of the more interesting sessions (for me) related to structured variable annuities. These are a relatively new product, and fill a market gap between traditional variable annuities (VAs) and fixed indexed annuities (FIAs). They offer the consumer more downside protection than VAs, while offering more upside opportunity than FIAs. The session was presented by Ari Linder of Munich Re and Simpa Baiye of PwC. 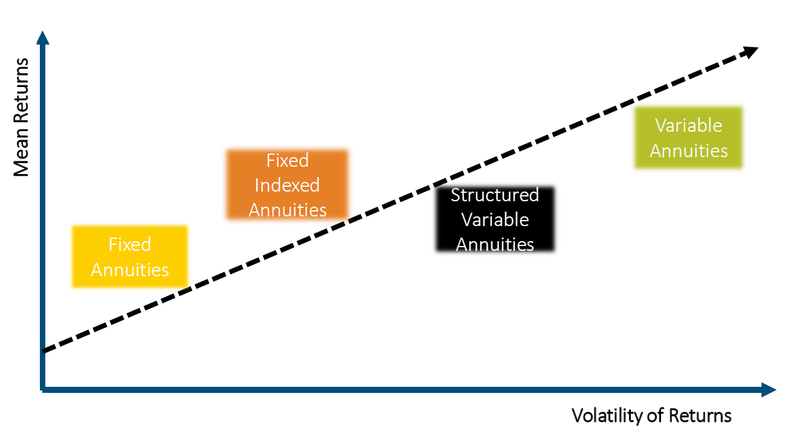 As both explained, a structured VA is constructed off of a reference market index. However, client funds are not invested in the index. Rather, the annuity writer creates index exposure through derivatives -- selling an out-of-the-money put option, and using the proceeds to purchase a call spread. The put creates downside protection; the call spread, upside opportunity. Client funds are invested in the annuity writer's general account. Investment income on the funds, along with product fees, is used to cover administrative expenses and profit margins. I've simplified, of course. There is quite a lot more to the product, including variations in the product offering, operational details, typical sales channels, accounting treatment, and so on. However, what most interested me as a former risk manager is the product's risk profile for the annuity writer. Similar to an FIA without living benefits, the structured VA writer bears very little market risk at the outset. The payoff to the client is mirrored by the payoff on the derivatives used to construct the product. Basis risk is minimal, because market indices are selected on the basis of derivatives market liquidity. 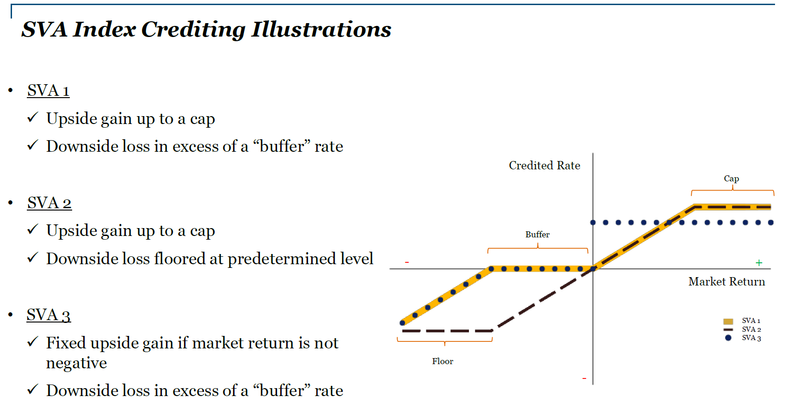 Volatility and interest rate risk are mitigated because the writer can adjust the product parameters (cap, buffer, floor) at each reset -- and higher volatility can reasonably be expected to increase proceeds from the sale of the put as well as the cost of the call spread. That's not to say market risk disappears. As Baiye noted, there may be opportunities for an annuity writer to exploit offsetting payoffs on traditional VA products to offset risk internally and reduce hedging costs; this would require more active market risk management. And as with FIAs, there is a need for the annuity writer to aggregate annuity contracts into cohorts that are large enough to buy derivatives against. Writers will need to bear or hedge some market risk at the margins. That said, the larger risk in structured VAs is one we know well at Ruark: Policyholder behavior risk. The product contains various disincentives to policyholders surrendering their policies, but there is always some surrender activity on financial products. Circumstances change -- both personal circumstances and market circumstances. So it makes sense for the annuity writer to buy derivatives on less than 100% of the exposure. But how much less? That depends on the annuity writer's assumptions about persistency. Will policyholder behavior on structured VAs resemble that of FIAs? Or that of VAs? With or without living benefits? A case can be made either way, especially with the confluence of distribution channels for VAs, FIAs, and even structured retail products. Surely today's annuity writers are seeing experience, but how might that experience change in the future? As product sales grow -- they are currently about $8bn per year -- we can expect the question to grow in importance.